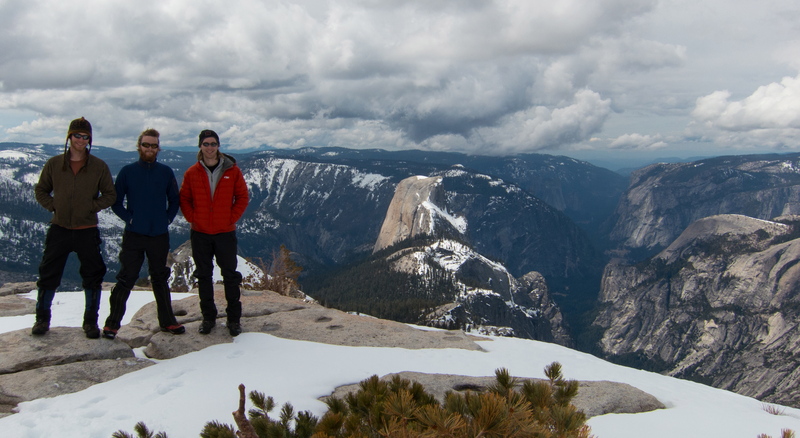 Having been defeated by snow conditions the previous year, we were back in Yosemite to attempt a summit of Clouds Rest in the snow. 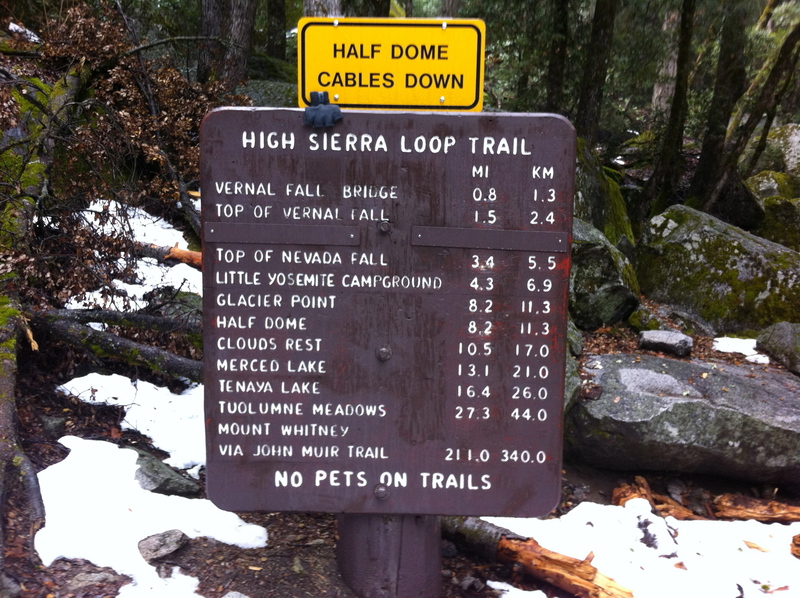 The goal once again, was to loop the valley starting at Happy Isles trailhead and climbing up-and-over Clouds Rest on our way to Tenaya Lake, returning via Tioga Pass and the Snow Creek trail to complete the loop. This winter had been warmer and dryer than the previous. 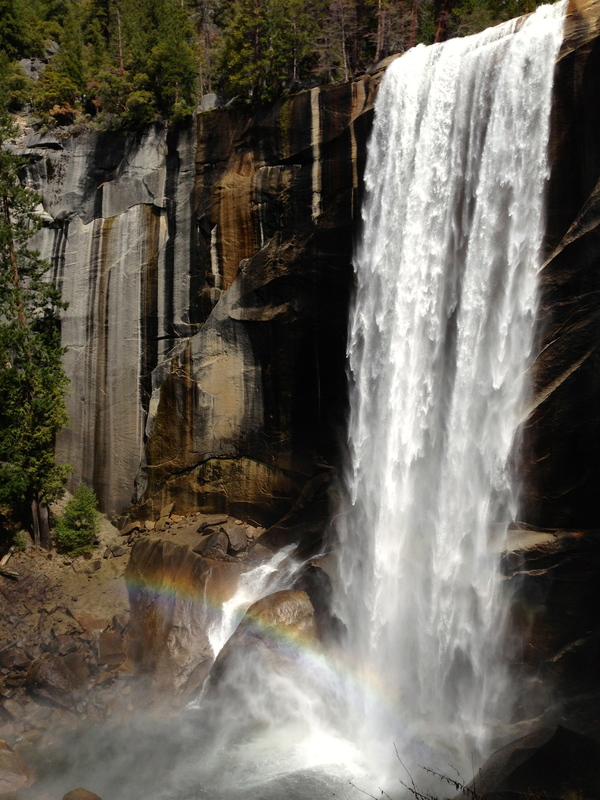 This was evident as we made our way up the Mist trail towards Little Yosemite Valley (LYV). Most years, this trail is still closed in March due to icy trail conditions. Not a problem this year. Using the Mist trail cut about 1.5 miles off the distance to LYV where we had camped the year before. 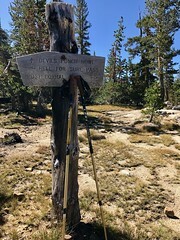 This year however, we continued a short ways past to where the John Muir Trail split from the Clouds Rest summit trail. We made camp near this junction. The ground was mostly free of snow, and there was a stream flowing nearby for water. It was about 4:30PM as we made camp and it began to rain. 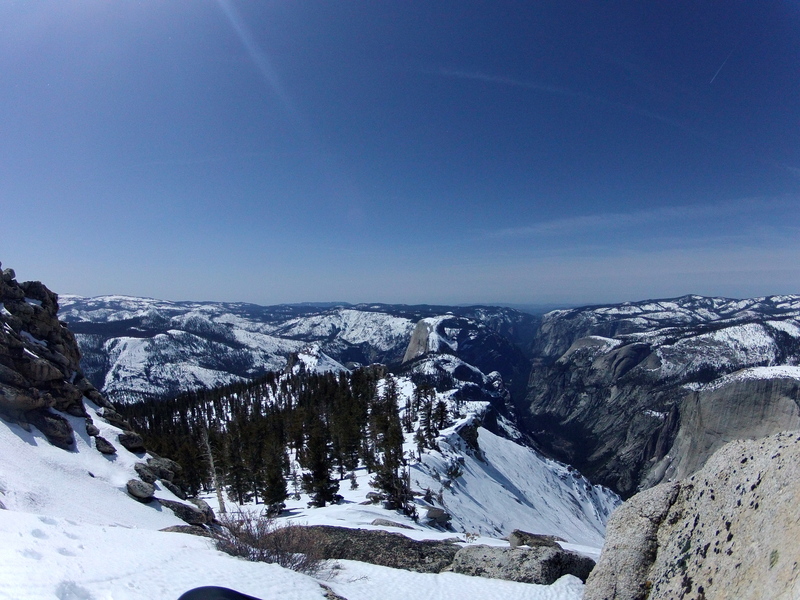 The next day we would be attempting the summit of Clouds Rest! The morning was cool, and the tents damp from the nights rain. 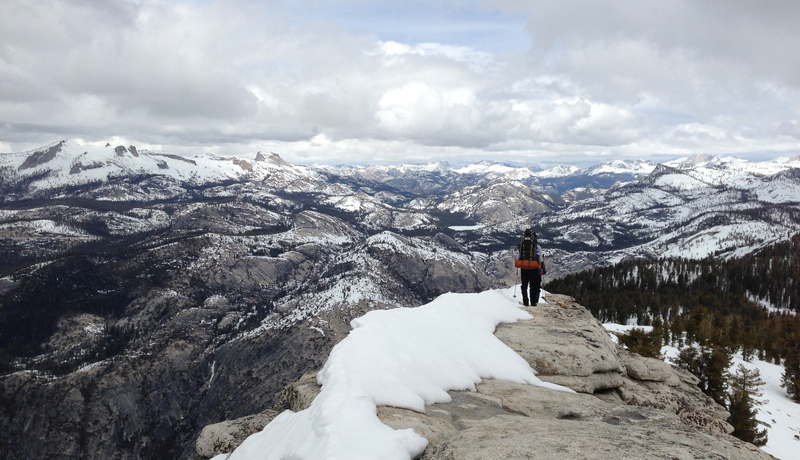 We didn’t waste much time breaking down camp as we wanted to give ourselves plenty of time to summit Clouds Rest. We hit the trail at 9:00AM. The sky was partly cloudy. It wasn’t until after the main switchbacks that we needed to put on snowshoes (The previous year we were in snowshoes starting from LYV). The condition of the snow was very good as we worked our way towards the summit. The weather was on our side as we made the final steep push that had turned us back the year before. Where there had been a sheet of ice, there was now dry steps leading us to the summit. On the summit just after noon, we could see for miles. The sun was out, but dark clouds were hanging in the distance. With another summit under our belts, we turned our attention to getting down before more weather moved in. We made our way off the other side of the summit, down the knife edge. From the summit, we made our way into the neighboring valley for camp. 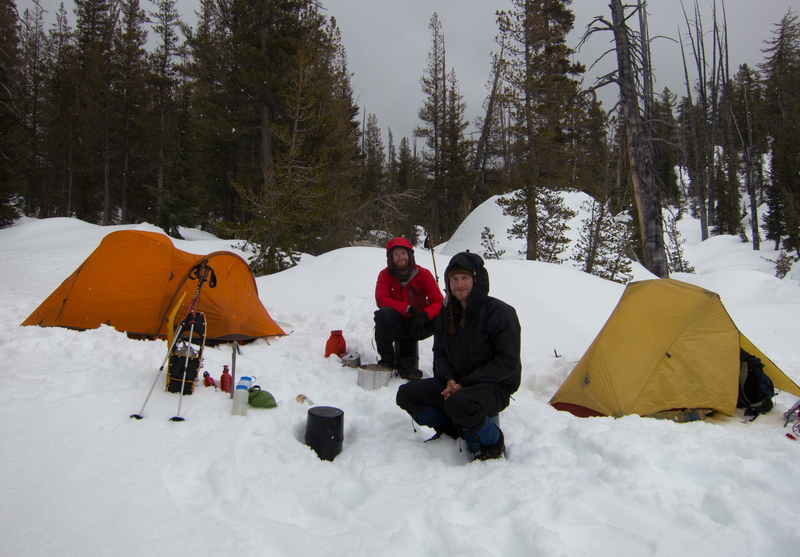 The valley was deep with snow, and it took some time to build a sturdy platform for the tent. We were once again camping near a stream, though this one was buried under about 4 feet of snow. The clouds moved in for night two of weather and it began snowing. 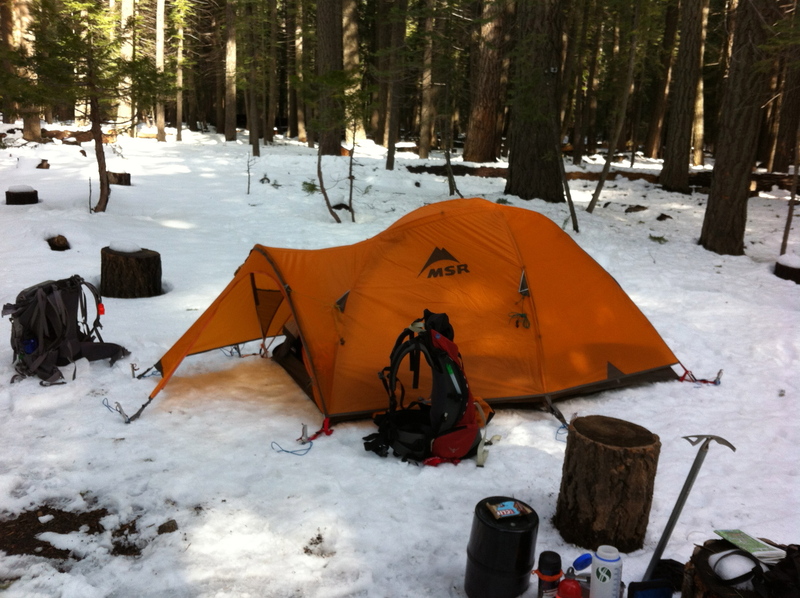 As daylight faded, large, heavy snow flakes began falling and we retreated to the tents. It had been a long day of snowshoeing, but the satisfaction of completing the summit was immense! 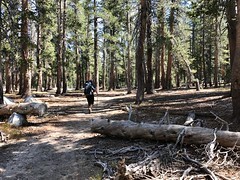 The next day we would be making our way to Tenaya lake then onward to Snow Creek Cabin. Continue with the second half of this trip HERE! Check out more photos on Flickr! Snow has been surprisingly absent from this years winter. 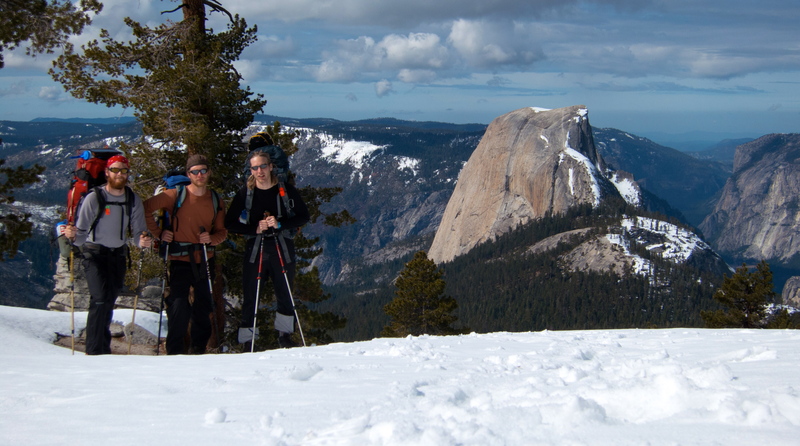 But a storm finally brought about 4 feet to Yosemite’s high country. This of course meant it was time to hit the trails for some snowshoeing! The recent storm had dropped a significant amount of snow in a short period of time, and because of the mild winter, this created unusually dangerous avalanche conditions. Because of this, we decided on a few route variations in case the conditions didn’t improve by the start of our trip. The idea was to do a loop starting at Happy Isles in Yosemite Valley, head to Tenaya Lake (crossing Clouds Rest, 9,931 ft), then loop back to the valley via Snow Creek. We arrived at the ranger station shortly after 9AM to get our wilderness permit and get some info on trail conditions and weather from the rangers. While the avalanche danger had decreased significantly, more weather was approaching quickly. They were expecting 3-5 inches above 6,000ft on Sunday and another 3-5 Sunday night with the snow line dropping to 4,000ft. Then more rain/snow on Tuesday. 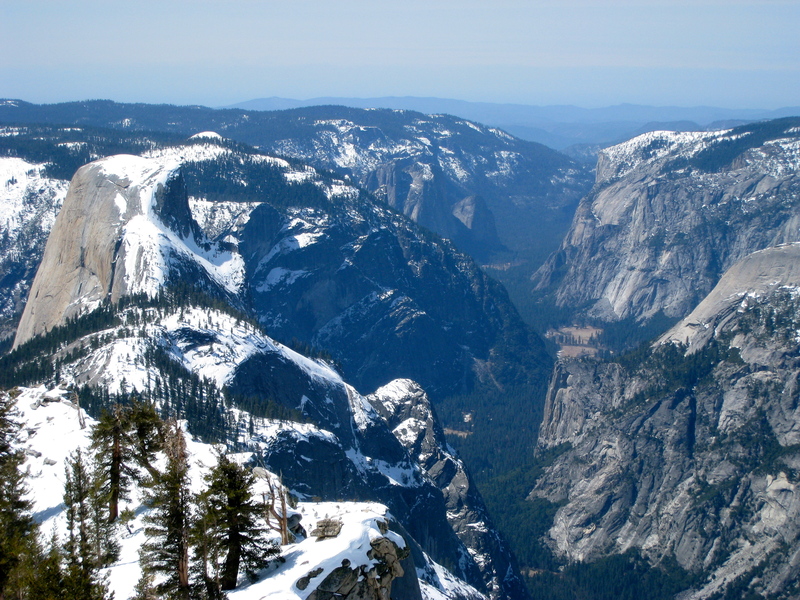 As we were talking with the rangers, a guy came in saying he had just come from near the top of Nevada Falls where he encountered foot-deep snow worthy of snowshoes. 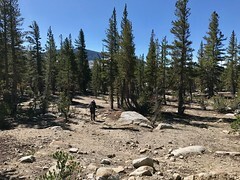 With this new info we got our permits for the loop with the idea that we would make a final decision on our climb up to Little Yosemite Valley (LYV). Permit in hand, we were on the trail! 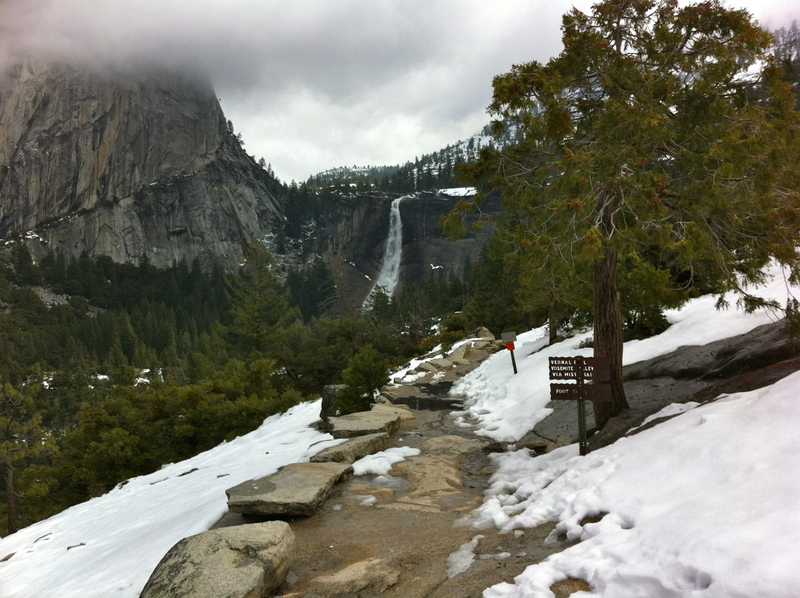 Since it was winter, a portion of the Mist trail was closed, diverting us to the John Muir Trail. This added about a mile, making the trip to LYV a little over 5 miles with about 2,200 ft of gain. The trail was steep, and we quickly climbed up out of the valley past Vernal and Nevada Falls. We passed a several people along the trail, but there were significantly fewer people than my last time on this trail, when I was making the trip up Half Dome. The trail was mostly snow-free with the exception of a few shaded switchbacks. The switchbacks going up the side of Nevada Falls were very steep, but offered a great view of the valley disappearing below us. As we continued up, we came across a portion of the switchbacks that had turned into a series of mini water falls as the melting snow came rushing down into the valley. I was definitely glad to be wearing my boots rather than the tennis shoes worn by most of the day hikers we encountered. Paul snapping some pics of the valley below. At this point we began wondering just how far the guy in the ranger station had made it before tuning around. 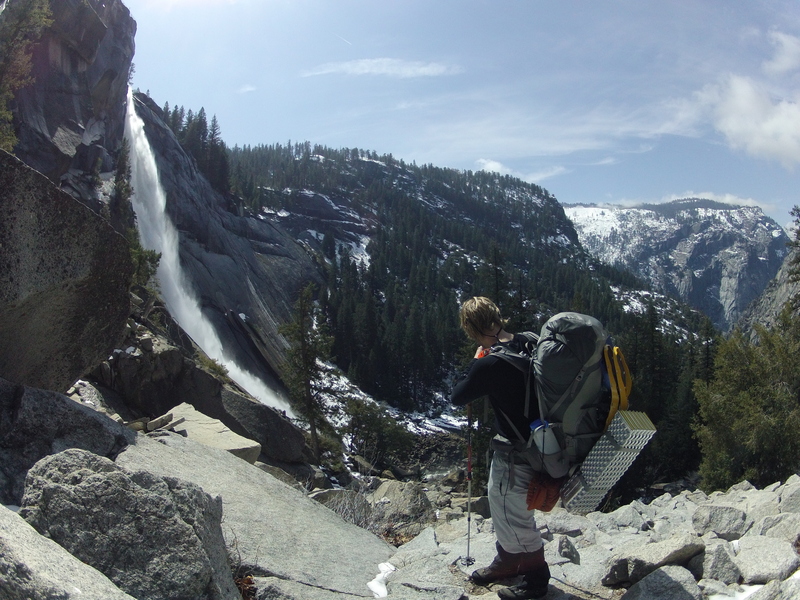 We were now almost 4 miles in, at the top of Nevada Falls, and had not encountered any snow that would have warranted the use of our snowshoes. How far had this guy really gone? And what time did he start in order to get to the ranger station at 9AM! Passing the top of Nevada falls marked the end of the significant climbing for the day. The trail flattened out and rolled along another mile to LYV where we would set up camp for the night. This is where the snow began to get deeper and form a consistent cover over the trail. However, there were plenty of tracks leading the way, making travel without snowshoes easy… This continued all the way to LYV where we encountered two other pairs of people that we would be sharing the campground with that night. 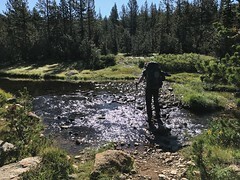 We arrived at camp around 3PM, pitched the tent, then found our way to the nearby stream to fill our bottles and relax a bit before cooking some dinner. This also gave us time to discuss our plans over the next couple days. We discovered that I had access to data thanks to AT&T’s wonderful coverage (it was a no-go for Paul’s poor Sprint phone…), so we were able to check in on the weather. Sure enough, there was some, possibly significant, snow coming in on Sunday. Since both of us are pretty new to winter backpacking with significant amounts of snow, we decided it would be in our best interest to stay in LYV for the storm. 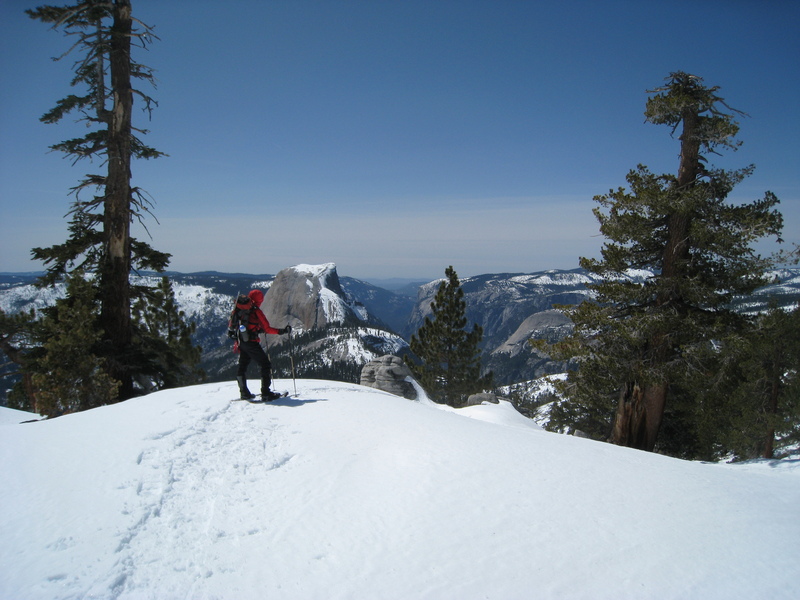 Our revised plans were now to base-camp it at LYV and climb Clouds Rest with day packs the following day. We would ride out the storm at LYV, then head back into the valley on Monday. After a nice dinner of three-cheese tortellini, it was off to bed! We got on the trail a little after 7:30AM, a tad later than planned. This wasn’t too big a deal since we had decided to go with day packs allowing us to travel at a much quicker pace. It was 7 miles to the summit, with about 3,800 ft of elevation gain. The trail was all up and it didn’t take long for me to be happy I wasn’t hauling a full pack!. 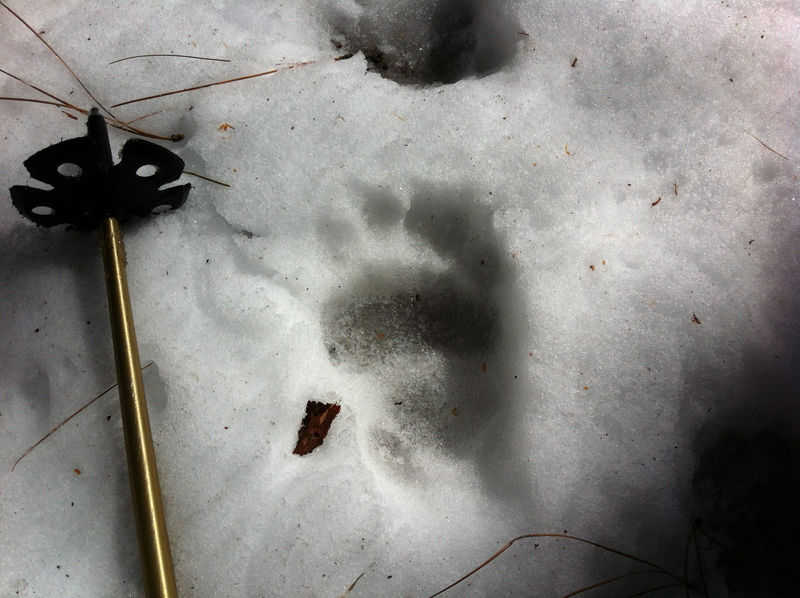 One of the many bear tracks on the trail. Being on a south facing slope kept the snow depth down, but as we climbed the snow slowly got deeper. We had been warned by the rangers that the bears had been very active this season, but we saw no evidence of the furry creatures around the campground. This was not the case on the trail… We came across many sets of bear tracks criss-crossing and following the trail. We even came across fresh tracks on the way back down! 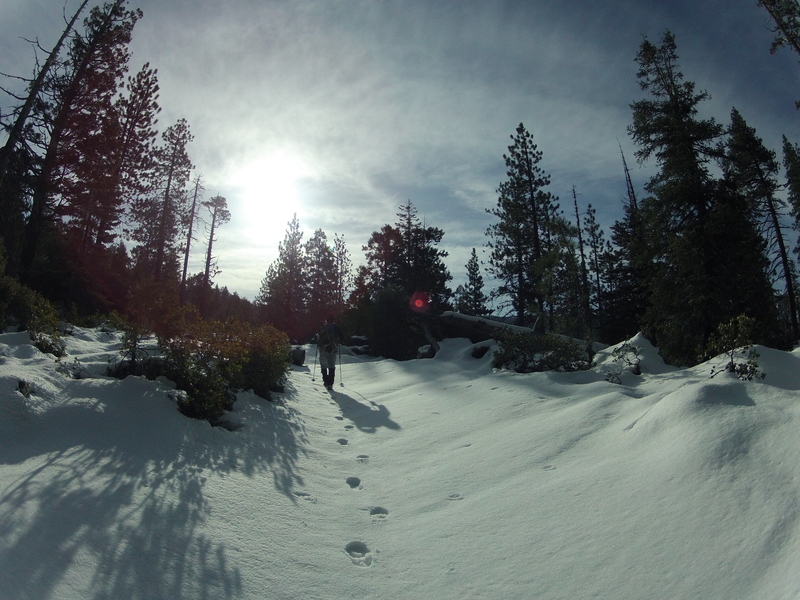 Continuing up the trail, the snow became a constant blanket under our feet. 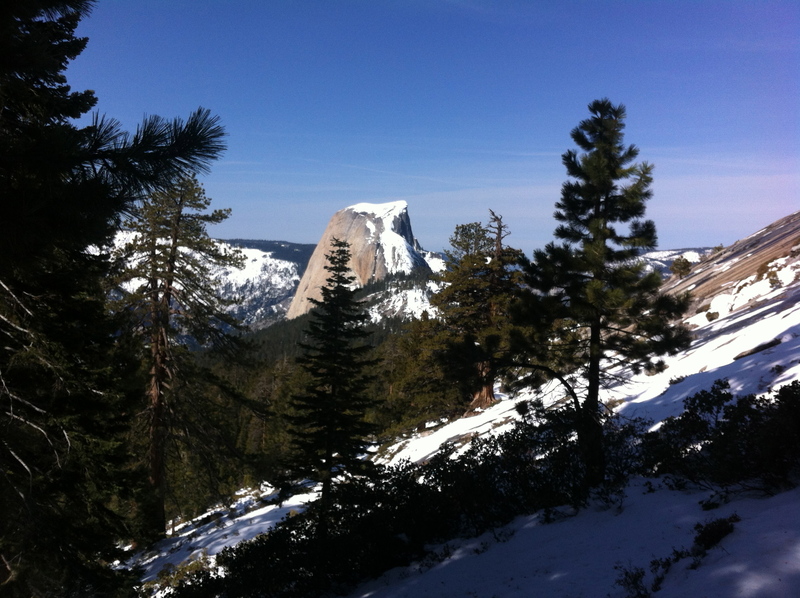 And after separating from the Half Dome trail we were given our first views of the surrounding area. Paul putting first tracks in on our way to Clouds Rest. No need for snowshoes yet! About a mile from the summit we crossed over a ridge onto a southeast facing slope. The snow depth jumped up to about 3 feet and the trail was no longer visible. We made our way across the snow through the trees gradually climbing up to the ridge that led to the summit. At the top of the ridge, the wind picked up significantly and we go our first look at the granite slope on the back side of Clouds Rest. We could see sections where the snow had begun letting loose allowing gravity to cary it down into the valley below. The last push to the summit was very steep. As I began making my way up, but it became clear that it was too steep for the snowshoes as I began sliding backwards with each step. This was definitely unfavorable as the snow was sloped just right to slide me right down the cliff into the valley. With the snowshoes off, I began post-holeing up the slope. This got me a bit further, but I ran into a section of thin snow sitting on a nice icy crust that offered little in the way of traction. With the wind gusting around 30 mph I looked down the slope on my left, then back at Paul who was having a bit of trouble dealing with the trail conditions. About 100 ft bellow the summit I turned around and took a seat in the snow. After a brief chat with Paul, we decided the snow conditions just weren’t right for us to continue. It was about 12:30PM and the snow was to soft to provide the right traction… Had we arrived an hour earlier it may have been a different story, but at that moment we decided to turn back. But not before snapping a few pictures of course! Back in the cover of the trees, we again strapped on the snowshoes and headed back towards camp. With 7 miles of descending ahead of us, we took our time and enjoyed a few extra sights along the way. We got back to camp at about 5:30PM. A significant amount of snow had melted during the day, and the other camp inhabitants had left. We refilled our water and made dinner… tonight was tuna pasta with alfredo sauce, yummy. As we filled our bellies with a much deserved meal, we reflected on our summit trip, and still felt that we had made the right call in backing off. And after checking the weather, it looked to have been the right call to base camp it at LYV rather than continue on the loop as the weather was beginning to move in. Unsure of what tomorrow would bring, we buttoned up camp, prepped the tent for the possibility of significant snow, and went to bed. Continue with Days 3 & 4!